No matter what your affiliation or level of interest in collecting coins, whether you are a novice just starting out, or a passionate and long-time collector, or a dedicated numismatist, it is all about finding the best ways to protect, store, and display your coins that requires the most attention. To satisfy this important requirement, and for all your silver or gold coin specimens, one of the perfect methods to accomplish this is by making use of a great and versatile product called Snap Lock Cases. Snap Lock Cases are not only a very appealing method to display and exhibit your collection, but will virtually guarantee the most effective way to safely handle them. In addition, they are manufactured to exacting standards using archival, PVC-free, inert components which have been proven best for storing and protecting your valuable collection for years to come. Snap Lock Cases will keep all the damaging environmental hazards from coming in contact with your coins, such as dirt and oils from your hands, chemicals and toxic by-products found around the home, as well as provide adequate protection from excessive temperature and humidity, all of which can harm your collection over time. Snap Lock Cases are a much better storage environment than paper-based or cardboard holders for your coins because of the possibility of eventual deterioration and potential leakage from by-products in the paper. Not only that, but Snap Lock Cases will go a long way toward keeping your coins from being unnecessarily scratched or marred while in storage or while viewing, which will certainly help them maintain their value. As a coin storage solution, nothing really comes close to Snap Lock Cases. They make accessing each of your coins fast and convenient by snapping open or closed, as well as providing a perfectly sized ‘fit’ for each coin, and are available for a wide variety of coin dimensions. Another great advantage is that Snap Lock Cases come in an interesting array of designs and layouts, which allows you the opportunity to offer some of your coins as gifts or keepsakes for any special occasion you may encounter, or even to spark some interest in coin collecting with your friends, family or colleagues. Using Snap Lock Cases in your coin collection storage strategy will put critical emphasis on protecting the integrity of your investment. The money and effort you spent acquiring your high-value coins will be safeguarded for generations of future enjoyment. Here is one of the most popular brands of Snap Lock Cases for you to investigate from Marcus. 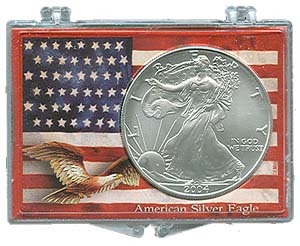 Marcus 2” x 3” Snap Lock Coin Cases – These popular coin cases come in an amazing array of configurations for all types of occasions and gift-giving opportunities: such as Graduation, Congratulations, Happy Birthday, It’s a Boy, It’s a Girl, US Flag, Bald Eagle, Happy Holidays, Season’s Greetings, and Merry Christmas. They also come in variations to hold numerous coin types such as Silver Eagle, Silver Dollar, Sacagawea, Bald Eagle, Indian Scene, Indian Cents, Steel Cents, Indian and Eagle, Statue and Eagle (Peace Dollar), and Cowboy (Morgan Dollar). In addition, these Marcus Snap Lock Cases are designed for 1 hole, 2 hole, and 3 hole coin configurations. Good coin storage and protection methods are extremely important in order to maintain the value and intrinsic worth of a coin collection. If this practice is ignored or done improperly, the chances of improper handling, deterioration or contamination will likely increase over the long haul, turning the monetary significance of a once-valuable coin collection not only into a unnecessary loss of investment, but its historical value as well. ← Coin Infomercials – What are they selling?